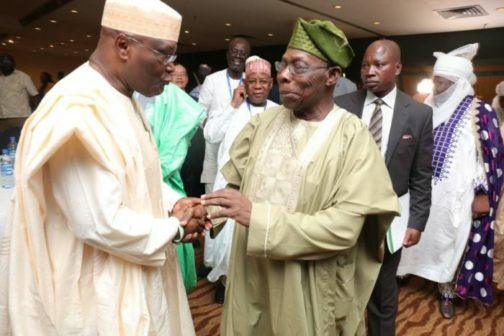 Olusegun Obasanjo, former Nigerian president has endorsed Abubakar Atiku, his former vice and candidate of the Peoples Democratic Party (PDP) for president in 2019 on the premise that he understands the economy better than the incumbent. The endorsement is coming on the heels of multilateral institutions like the IMF giving knocks on the management of the country’s economy. Obasanjo spoke when Atiku Abubakar and leaders of the PDP visited him at his Abeokuta home. He added: “Let me start by congratulating President-to-be, Atiku Abubakar, for his success at the recent PDP primary and I took note of his gracious remarks in his acceptance speech that it all started here. He said took the stand he had taken based on the character and attributes Atiku exhibited in the position he found himself and that he strongly believes that I was right and in the overall interest of everyone and everything to take such a position. “For me, relatively and of all the aspirants in the PDP, you have the widest and greatest exposure, experience, outreach and possibly the best machinery and preparation for seeing the tough and likely dirty campaign ahead through. “You have better outreach nationally and internationally and that can translate to better management of foreign affairs. You are more accessible and less inflexible and more open to all parts of the country in many ways. As Pastor Bakare, one-time running mate of the incumbent President said, “You are a wazobia man.” And that should help you in confronting the confrontable and shunning nepotism,” he noted. He specifically enjoined him to uphold truth, integrity, principles, morality and fight corruption, crimes and insurgency. “The fundamental law of the land, our constitution must be scrupulously defended. I make one demand and one demand on you today, I need you to say before God and man that you will always remain irrevocably committed to upholding ALL the provisions of the Constitution of the Federal Republic of Nigeria and the whole country will remain your single indivisible constituency.